By Barbara Dubbeldam, November 28, 2018 at 4:23 pm . On Friday 23 November, Hackers & Designers, together with Froh! organized a lecture evening to kick off the two 48-hour workshops ‘The Universe of [ ] Images’. The evening and first workshop were hosted by Fanfare. The second workshop will be held in December in Cologne. In these workshops journalists, designers, artists, filmmakers, hackers are invited to explore and experiment with the role of technical applications within the de-/construction and perception of (visual) truth, now that images no longer serve as pieces of evidence. How can the tools that are built and used shape how media is published and consumed? 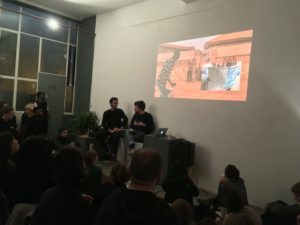 The evening set the context for the workshops and was kicked off by Fanfare with a presentation about physical publishing and their history as a nomadic studio and non-profit platform for graphic design and visual arts. Their nomadic existence forced them to design a traveling display for exhibitions that was flexible but also enabled them to retain their identity. Next was an interactive presentation about Aesthetic Warfare by Arthur Steiner and Leonardo Dellanoce. They initiated the Digital Earth Fellowship program, and are co-curating Vertical Atlas, a research project investigating the use of the Stack methodology as a way construct new maps to navigate the layered, interconnected and disconnected technological realities, as current maps fail to capture these complexities. The presentation illustrated some localities of the universe of [ ] images with three stories from different geozones. The next Vertical Atlas focusses on the Russian digital cosmos, with two public events: 29 November at the Nieuwe Instituut in Rotterdam and 2 December at the Stedelijk Museum in Amsterdam. With the presentations the participants of the workshops were given interesting questions and cases to start exploring, navigating and perhaps designing a new universe of [ ] images. The title of the symposium and workshops is based on the book ‘Into the Universe of Technical Images’ by Vilém Flusser.